In my 10 years’ experience as a B2B sales professional, I can say with confidence that any client who initially objects to your price and uses that as an excuse not to purchase your product or service simply brushing you off. For starters, do NOT be sucker and immediately drop your price. 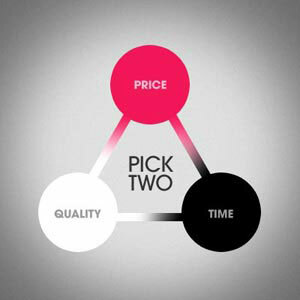 If you simply sell based on price alone, you are an order taker. Sorry to break it to you but there is no ‘salesmanship” in giving your best price and taking an order. Any customer service agent on minimum wage answering a phone can do just that! The most important “sales training” I have ever had is working for a company selling higher priced products at a non-negotiable price point. Rather than focusing on price, I’m forced to focus on the quality and service that my company can deliver. To properly relay that information and translate that into a sale, requires work and that my friends, is salesmanship. Clients have to realize that they can’t have everything and by everything I mean the best product at the best price that is delivered with the best service. At best, most companies can offer 2 out of the 3. Let’s walk through the process through a general scenario. They are right. I’m not getting this sale. I can’t beat the price, so I better move on. 2. Game on! Now the real selling begins! I hope none of you sided with option 1. If you did, you either need more training or should consider changing careers. 1. Be Firm: Don’t negotiate your price. 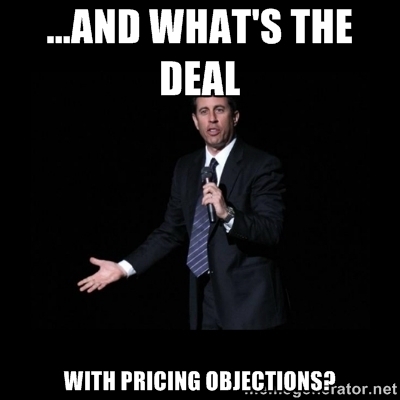 Others pay full price, so why should this client be an exception? If you have other clients in the area that this client would happen to be competing with who happen to be using your product of focus, make that known. If those direct competitors of your client aren’t using your product yet, make it known that you will be calling on them afterwards, All the more reason that “you” don’t really need the business as much as they think you do and therefore have no need to budge on price. Reverse psychology can go a long way. 2. Elaborate: Focus on other features and benefits that your company can provide (i.e. better service, higher quality). 3. Be Creative. If you are in your clients’ environment, look around for clues that might give them reasons to use a product from your portfolio that they may never thought of using before. Sometimes I’ve been in a clinic and see a list of things they are looking for. Simply pointing that out and mentioning that I can offer one of those items has gotten me the sale many times. On the other hand, if you are meeting outside of their working environment be sure to ask them more questions about their business while in the back of your mind searching for products or services you can offer them. Once this dialogue is open, you’d be surprised at how open most people are. 4. Ask For the Sale: As you scan through all of the potential products your client could purchase and they demonstrate interest, be sure to ask for the sale. 5. Be Persistent: This is where I have the most fun. Once you’ve gotten them to order one product, why not ask for more? Laugh and have fun with it. Your client knows that you are there to sell them something so they expect it. If they haven’t ordered anything yet, keep asking! I have no shame in asking for the sale multiple times in a single call. I think my record was asking for a sale 10 times in one call. After striking out 9 times, when I asked the 10th time, I finally got the “Ok, you got the sale!”. I realize full well that he may have done that to get me out of his office (another brush off, yes I know! ), but regardless I did get the sale, was welcomed back and continue to get more business. Always keep in mind that if you can get at least one of your products or services in the door, that leaves that door open for you to come back and acquire more business, so don’t give up at the slightest objection. Experiment: If you are used to selling on price alone, for one day or one week conduct all of your sales calls as if you are not allowed to budge on price. I would love to hear your results! This entry was posted in Challenges, sales challenges, sales for small business, Sales Tips and tagged objections, price point, sales, sales process, salesmanship, selling on July 16, 2015 by TravellingSaleswoman.